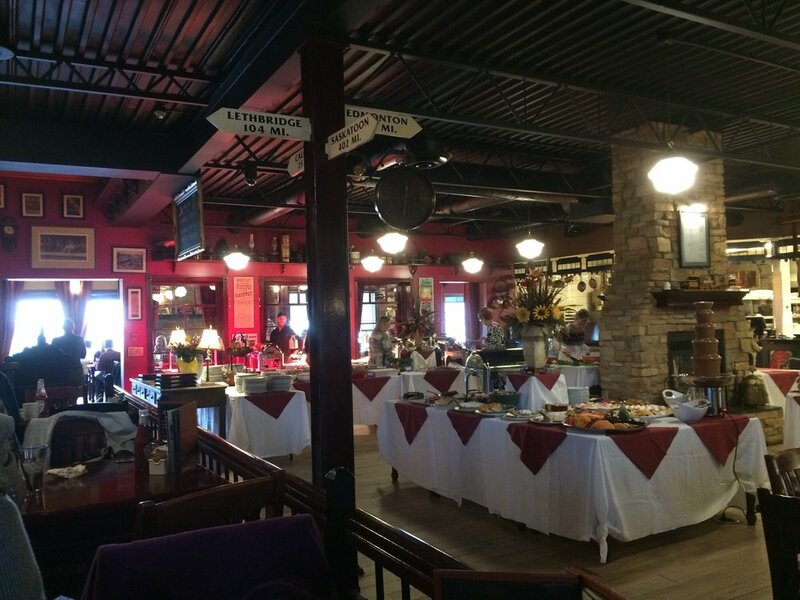 This is one of my favourite places in Strathmore, for one very specific reason – the Sunday Brunch Buffet. While the regular menu is okay (we’ve eaten here lots over the last six years or so that we’ve lived in Strathmore) it’s nothing super unique. There are family style entrees, sandwiches, salads and some interesting desserts. However, if you head here on a Sunday morning, they put on an unbeatable, truly amazing spread. 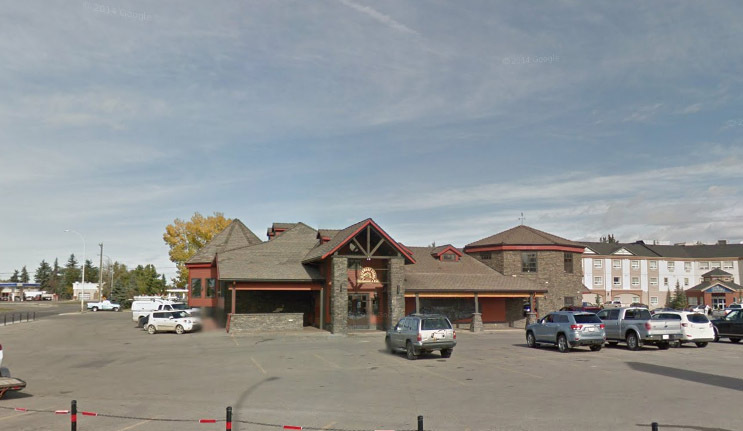 My husband and I are particularly into brunch spots, and have tried many in the greater Calgary area, but Strathmore Station is by far our favourite. 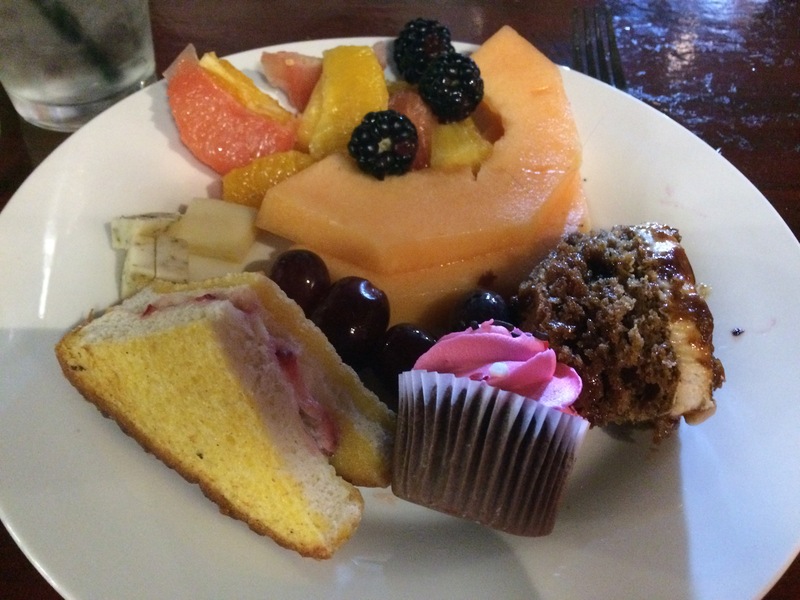 The buffet is spread into several sections. The first has stuffed french toast (strawberry and cream cheese as well as banana and chocolate), eggs benedict (both ham and salmon varieties), roasted meats (usually roast beef, ham and turkey), pasta or other main dish selections. The lasagne is fantastic, but not quite as good as the pulled pork mac and cheese. My husband is also a fan of the ribs! The middle has a wide array of salads, from traditional greens to mediterranean to pasta salads, quiche, salmon, and cold cheeses. 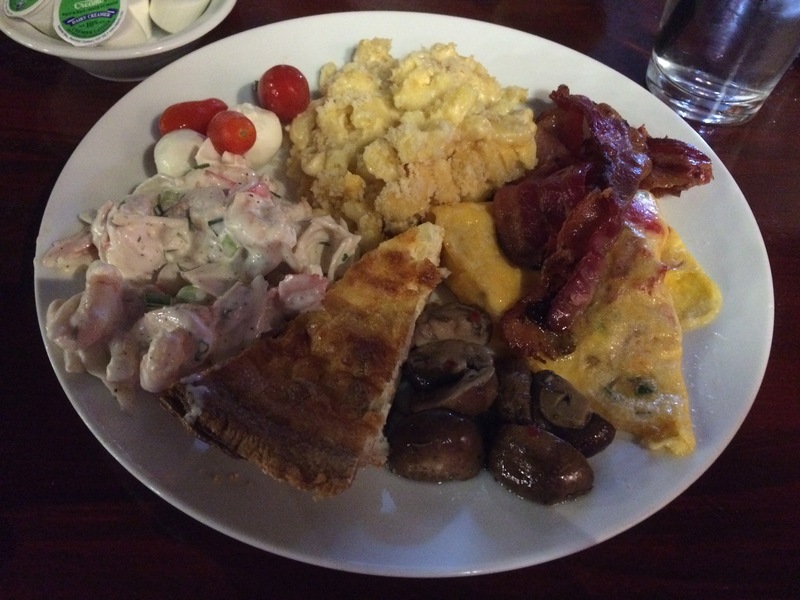 The rear has hot breakfast items, including scrambled eggs, pancakes, french toast, sausage, bacon and omelettes. Shellfish items are on a separate table, which is a great concession for those with allergies. If you don’t have allergies, be sure to hit up their house-made seafood salad here, as it’s to-die-for. Then, of course, the piece de resistance – the dessert bar. It’s huge and is full of house-made delicacies. The pastry chef at The Station is wickedly talented. For me, the fresh fruit they have (even out of season) is always amazing. I usually can’t resist trying one or two of the pastry items as well. The only thing I’d avoid here is the chocolate fountain as I’ve seen kiddos with fingers (and once even a tongue) in it at least once every visit. On our most recent visit, I also noticed that they had added a candy bar, with various jars of different candies. I didn’t explore it too much as the cupcake and toffee pudding I’d sampled were enough sugar for me, but for families with kids this might be a huge hit (and who knows, maybe it’ll keep them out of the chocolate fountain!). They also have a fairly sizable gluten-free menu if you (or a friend or family member) are looking for that in town. Most places in Strathmore only have one or two items that they can make gluten-free, but The Station offers an array of choices. If you’re looking for a happy hour stop, head downstairs to the pub area, where you can get great specials on wings and sliders as well as top-notch cocktails. In general, service at the Station is hit-or-miss. I’ve had great and terrible servers both upstairs and down, but it seems to have improved (in general) from a year or two ago. When we first moved to town, we always had great service, then it hit a slump for a while, and now seems to be headed back in a better direction. There is high staff turnover here, so you are unlikely to have the same people serve you many visits in a row. The ambiance here is fantastic. After recent renovations, the place is sprawling and comfortable, with a main area with high ceilings and open seating, to a train car on one side with fun luggage racks and windows (excellent if you’re dining with kids), to two turret areas for more intimate gatherings and a side section with even more seating. There’s a private room available for rentals and small groups on the pub level, which is fully enclosed and fairly quiet once the doors are shut, even when the pub is going strong (I’ve been to a few meetings here, and they were lovely!). There is additional patio seating in warm weather, outside, if you like dining al fresco. My only complaint is that at times, it can be quite dim in the restaurant’s main area, even on sunny days, as the additions all have the windows, round the edges, and there is no natural light in the main area any longer. As such, I’m always happiest seated in one of the outer areas, and the hostesses generally will take requests as long as it’s not too busy.